John Battelle describes a search engine as a 'database of intentions' offering 'a place holder for the intentions of humankind - a massive database of desires, needs, wants, and likes.' Tuning into this data can therefore potentially identify front runners for popular competitions where public voting determines the outcome. The Eurovision Song Contest is a massive, televised European event with the majority of European countries entering an act and then phone voting to establish the overall Eurovision winner. The voting is often controversial (with tactical voting and politics coming into play) though, as proved in 2009, it should still be possible to make some predictions using Search patterns from aggregated Search data. 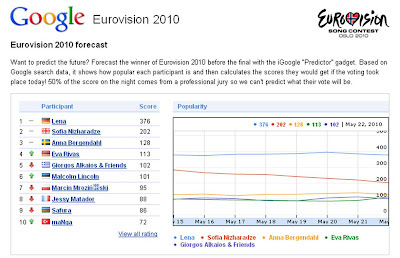 For the ESC (Eurovision Song Contest) 2010 Google have made analysing Eurovision Search data easy by introducing a Google Eurovision 2010 Predictor gadget. So the current Eurovision favourite is Germany, however there is a note of caution that the Google Predictor tool tends to be less reliable at assessing Eastern European intentions - Google dominates Western Europe, but Yandex is a key player in the East. So will Google get it right or will someone else be celebrating in Oslo? 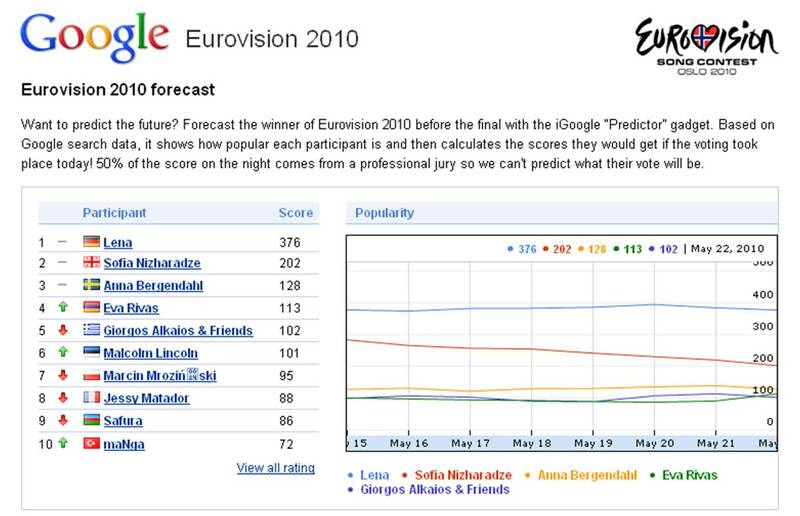 Eurovision and Twitter - #eurovision the ultimate social TV?